Israeli soldiers abducted, on Tuesday at dawn, at least sixteen Palestinians in different parts of the occupied West Bank, after the soldiers invaded many Palestinians areas and searched homes, the Palestinian Prisoners’ Society (PPS) has reported. 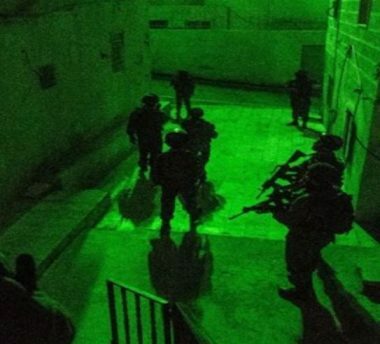 In Hebron, in the southern part of the West Bank, the soldiers invaded many homes in the governorate and abducted four Palestinians, identified as Mahmoud al-Fasfous, Abdul-Aziz Waleed Sweity, Hamza Hisham al-Haddad and Tamer Mohammad Alama. The soldiers also invaded the home of a former political prisoner, identified as Sofian Jamjoum, in Jabal Abu Rumman area, in Hebron city, and confiscated his wife’s car. Also in Hebron, the soldiers summoned Nour Qfeisha for interrogation, after invading his home, and many other homes in Hebron city. Owners of three of the invaded homes have been identified as Soheib Abdul-Halim, Anas Qfeisha and Naji al-Atrash. The army also invaded Beit Ummar town, north of Hebron, and caused many residents to suffer the effects of teargas inhalation, in addition to summoning Mojahed Awad, 27, for interrogation. In Qalqilia, in northern West Bank, the soldiers abducted Ezzeddin Mohammad Mahmoud, and his son Mohammad, after invading and searching their home. In Nablus, in northern West Bank, the soldiers abducted two Palestinians identified as Yassin Habroon, 29, and Ramez Tareq Qa’dan, 30. In Jenin, also in northern West Bank, the soldiers abducted Mohammad Ibrahim Kabaha, and his two sons, Nasser and Osama, from their homes in Barta’a town. In Tubas, in northeastern West Bank, the soldiers abducted Hotheifa Hafeth Salahat, after searching his home. In Salfit, in northwestern West Bank, the soldiers abducted Salem Mohammad Abu Ya’coub and Mohammad Waleed ‘Obeid. In Bethlehem, south of occupied Jerusalem, the soldiers abducted Amir Khamis. In related news, the army invaded Beit Hanina neighborhood, north of Jerusalem, and demolished a carwash facility, under the pretext of being built without a permit.